"Before the season, I was hoping to take a win. Unfortunately, I didn't succeed but on a couple of occassions I was pretty close." 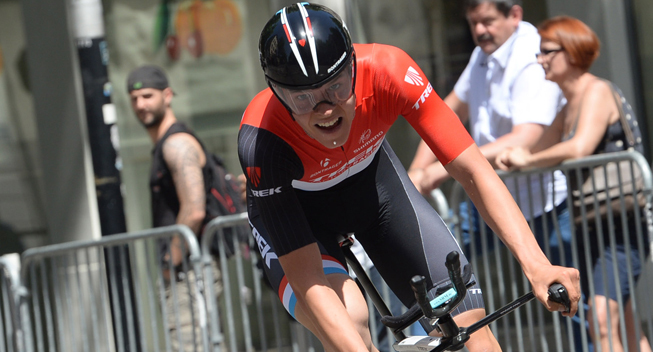 With several solid showings in WorldTour races, Bob Jungels confirmed his great potential in 2014. However, the Luxembourger failed to achieve the elusive victory. That Bob Jungels (Trek) did take a single win in the past season was less due to his performances and more due to a very demaning race race calendar. Hence, the Luxembourger draws a positive balance of his second year at the pro level. "Before the season, I was hoping to take a win. Unfortunately, I didn't succeed but on a couple of occassions I was pretty close," the 22-year-old told radsport-news.com, referring to his 9th place in the the Critérium International (2.HC) which he achieved by taking third in the time trial, a second place on a stage of Paris-Nice and a third place in the opening time trial of the Criterium du Dauphiné. "It was the first season in which I did a lot of WorldTour races so I am pleased with these results." After he had finished second in the Luxembourg time trial championships and fourth in the road race, Jungels focus on the second half of the season where the Vuetla a Espana was on his schedule. Even though his preparation was not optimal due to a couple of crashes, Jungels started his first grand tour well by taking two 9th places in the first week. From there things got worse as he was involved in a few more crashes. Finally, Jungels had to end both the race and the season prematurely due to a saddle sore. "That was a big disappointment," he admitted. In the upcoming season, Jungels wants to improve by following a similar race schedule. "And I won't complain if I take a victory," he added.